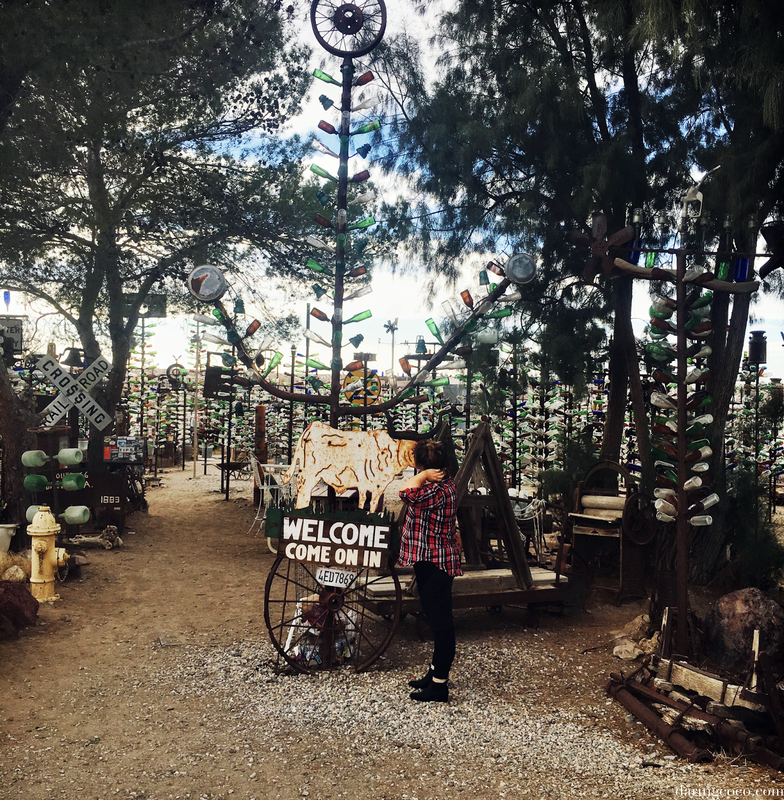 On the way to Las Vegas, we abandoned the typical congested Californian freeway and took a detour down good ol’ Route 66. Of course this was hardly accidental. 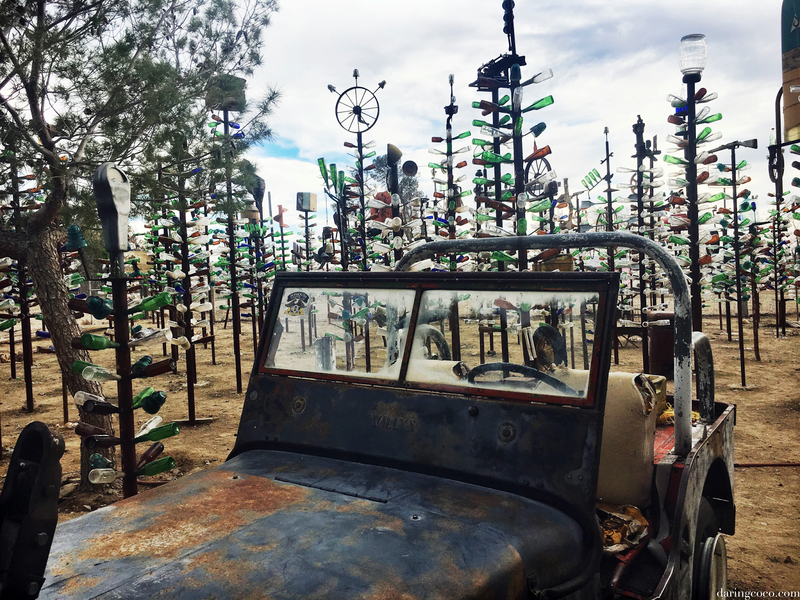 Our destination all along was set for Elmer’s Bottle Tree Ranch. 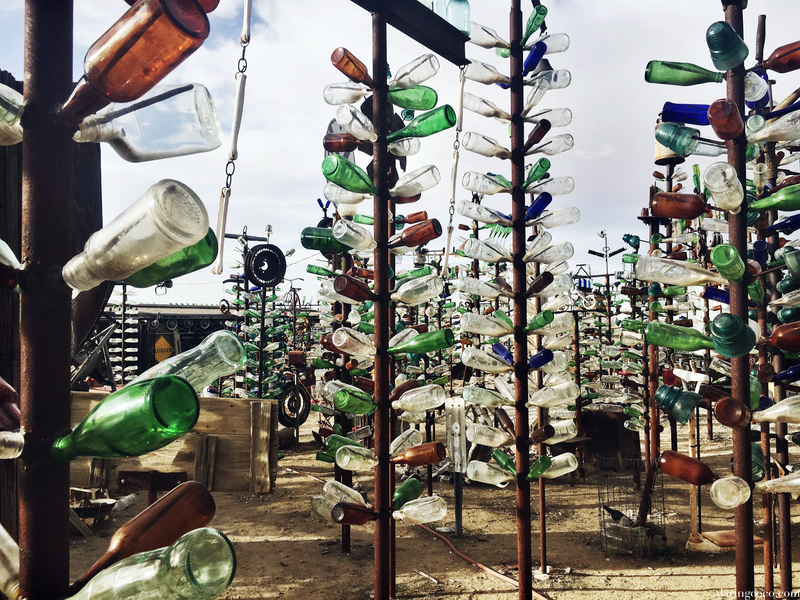 Located out in the desert, quite literally in the middle of nowhere, Elmer’s Bottle Tree Ranch springs forth like a metaphoric oasis of sorts. The usual promise of water and refuge replaced by fantastical colour and charming vintage whimsy. 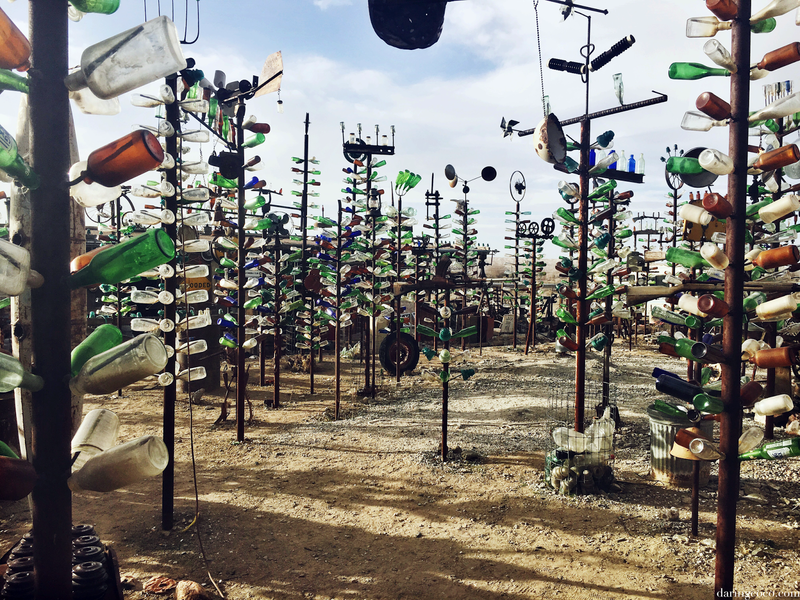 Within these grounds you will find various artistic installations, the most prominent being a forest of metallic handmade trees adorned exclusively with discarded glass bottles. And if you’re lucky enough you may just meet the man behind the work himself, Mr Elmer Long. Unfortunately as fate would have it our paths did not cross and I did not get to meet the man behind such a lavish creation; something I was desperately hoping for. Nonetheless this did not deter my mood as we enjoyed traipsing through the grounds, admiring countless multicoloured trees. Of course neighbouring in those very grounds are various oddities and curiosities that await to be uncovered. From retired, rusting Jeep’s to defective and mutilated typewriters. There are numerous weather vanes, some original and others melded and created by Elmer himself. Personally I adored the display and creations using skulls and antlers, which seemed to speak to my inner boheme and macabre side. I wondered where he found such pieces, or if they’d been collected from neighbouring lands. Perhaps even donated by cattleman. And much like those skull displays there’s also a discarded, non-functional weapons staked on metal stalks alongside those famed trees. 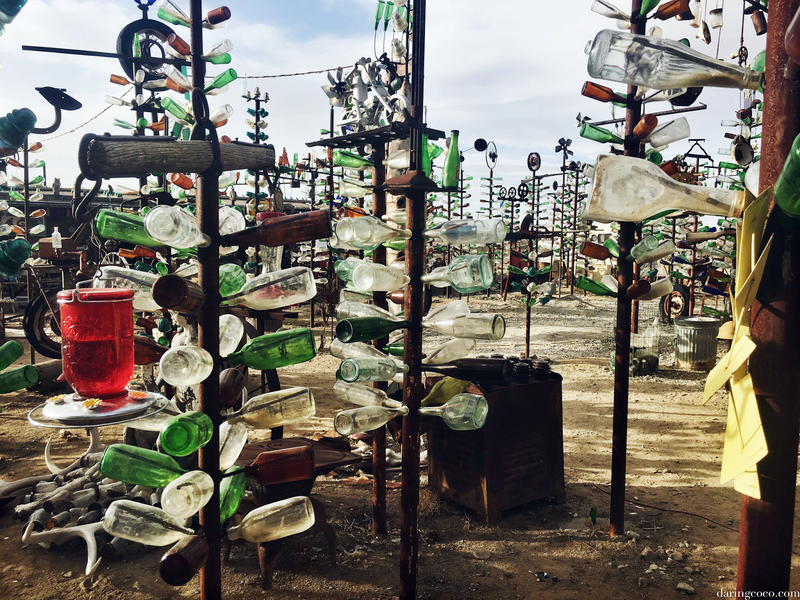 These installations aren’t plentiful, there is probably a good handful strewn throughout, but much like every artistic concoction found at Elmer’s Bottle Tree Ranch, it is a marvel to discover. 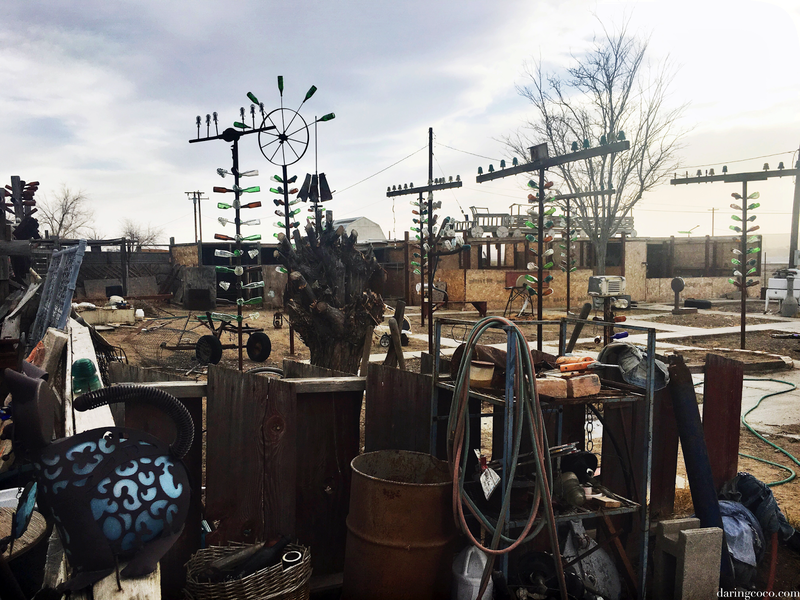 There’s such an eclectic mix and maze to everything at Elmer’s Bottle Tree Ranch and a former expectation of haphazard, yet it is antithetically peaceful and poised. 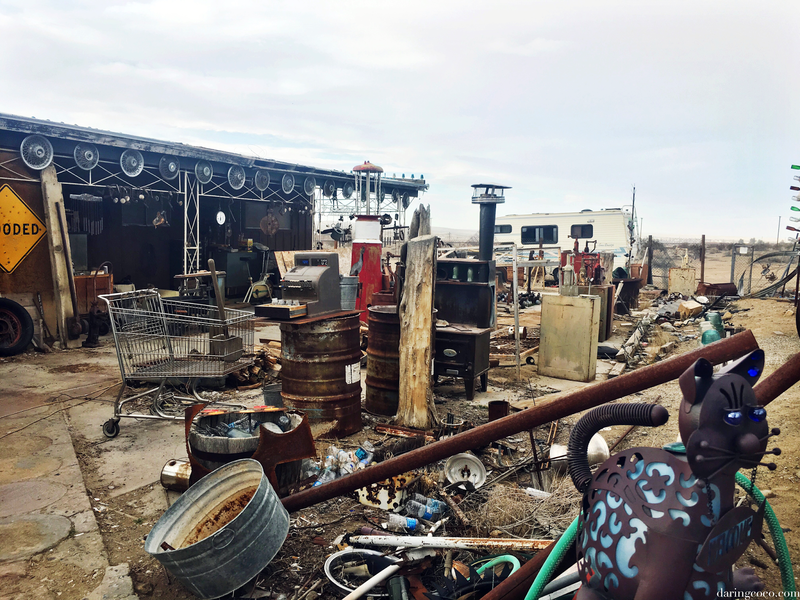 Even at the back shed, a jumble of scrap metal, parts and abandoned items should all feel frenzied and harsh not catalogued and coordinated. If this is the actual case, I can not say but there is no denying how much passion and adoration abounds. While this is a sight for the eyes, it doesn’t stop there. There’s a real sense of calm and introspection that comes from the serene chimes that vibrate from above with the wind. This was most unexpected for me as I had anticipated a vibrant overload to my senses and not one of an ataractic nature. These wind chimes are scattered throughout the grounds, so no matter where your feet may lead you, that sweet jingle will continue its chorus apace with you. 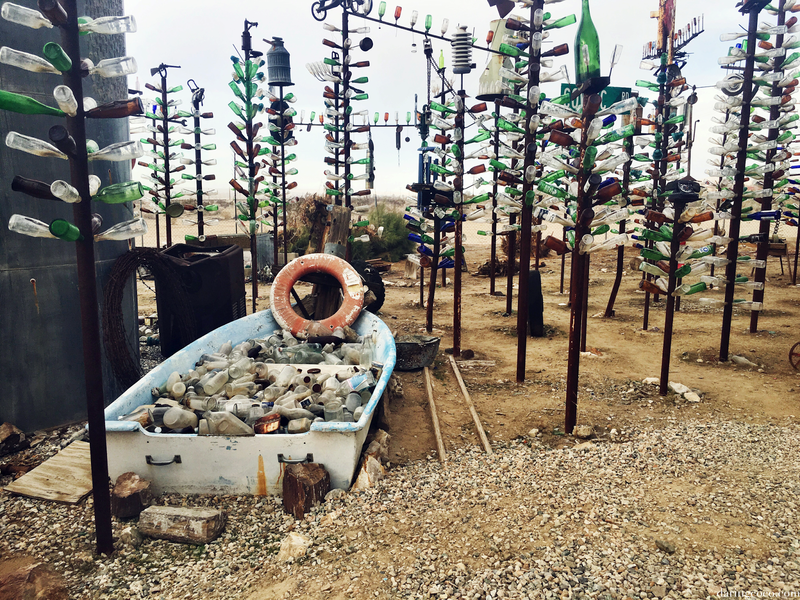 Elmer’s Bottle Tree Ranch is a true gem ensconced by typical nothingness. And it surprises me how little are familiar with this extraordinary place; especially amongst Americans. I was always so taken aback by their obliviousness to this, especially being in their very on backyards. Here I was, an Aussie from the southern parts well versed in a site with high regard and one I continuously compared to with other notable locales, like Hollywood or the Grand Canyon. Then again, the Unites States is such a vast country and to be knowledgable in all it’s nooks and crannies isn’t something one would expect. I know I certainly am overly uneducated when it comes to my own country. 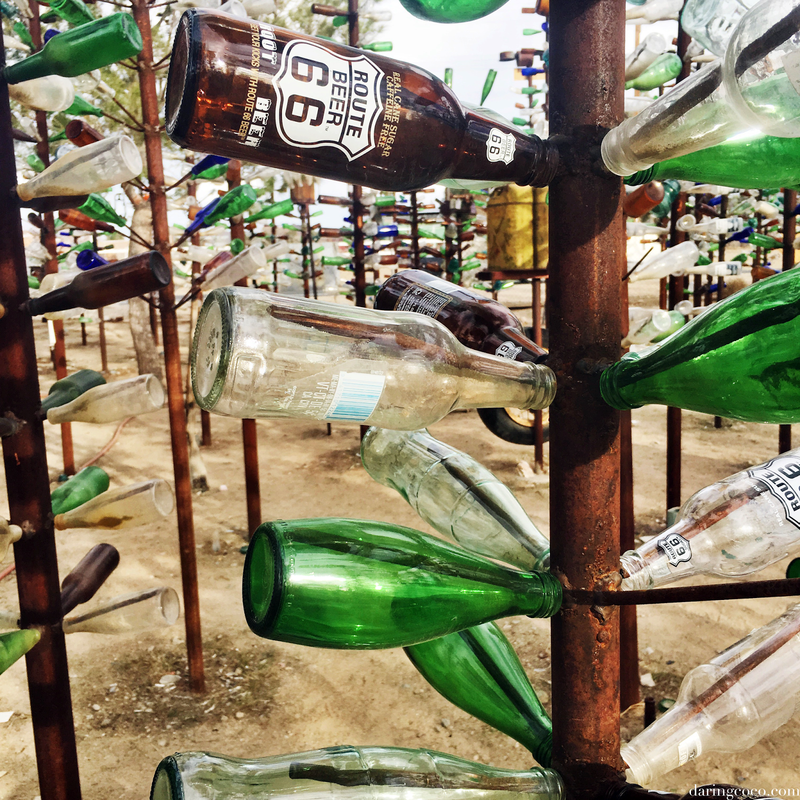 This is such a wondrous place and I highly recommend stopping by Elmer’s Bottle Tree Ranch. This is a site housing one mans creative passions and recyclable flair. A site that gives true meaning to the phrase “one mans trash is another ones treasure”. It’s a sight for the senses but best of all it is undeniably tranquil and transformative.